The last few days were all about hanging out with my friends and watching trash television in the afternoon, I had no idea it could be so much fun. I finished watching Modern Family the other day and now I have a hole in my heart and I need to find a new one. Any suggestions? 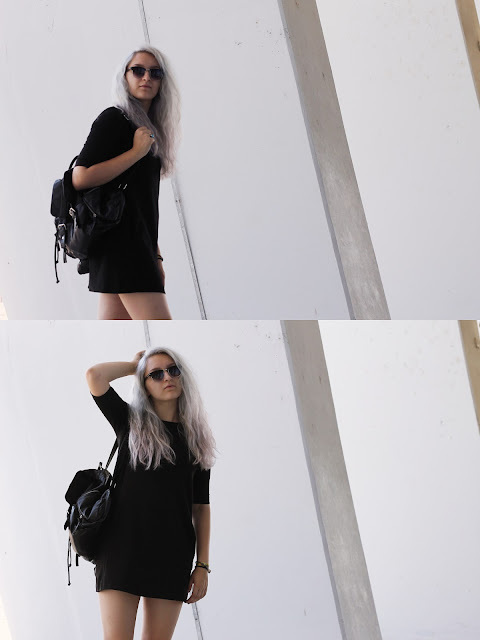 The Little Black Dress I am wearing from H&M and the black leather backpack is from Primark. To add some color, I wore my new slip on Vans with a flower print which look absolutely amazing and are great for summer. I wanted to keep the outfit minimalistic so I did not wear a lot of jewelry. I wore a ring with a big turquoise mineral which is from Ornament. And yes, I still have my INmusic bracelet on and I may hold onto it for a while.